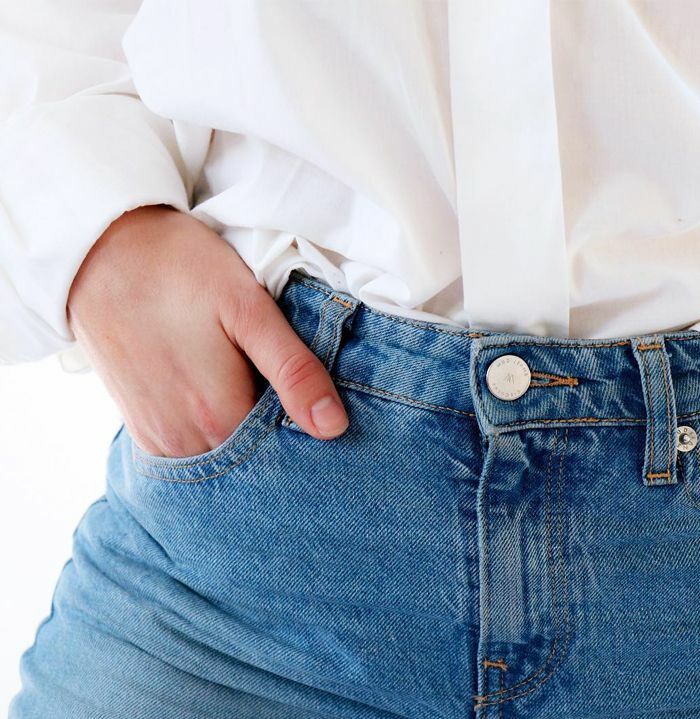 “To create one kilogram of conventional cotton (roughly the amount needed for a shirt and a pair of jeans) can take an astounding 10,000–20,000 litres of water,” reads just one of the jaw-dropping facts on the sustainability manifesto of leading luxury denim brand M.i.h Jeans. There are so many factors when it comes to creating sustainable (let alone ethical) denim: Firstly, there’s the fact that the extraction of cotton (which is what denim is made of) is by far the largest contributing factor towards water wastage and water pollution in the world. Secondly, the overproduction of cotton damages fertile ground, and that’s before we even start to tackle nonorganic processes, which can include workers and the land being exposed to terrifying amounts of dangerous chemicals. Then there’s the production of the jeans. Who’s making them, what are the conditions and in which country are they manufactured? How about all of the little details one might overlook, such as zippers, buttons and cotton stitching? What happens when dyeing isn’t regulated? Where are the final products shipped from, and how? What’s the packaging made of? It’s overwhelming and complex, I know. 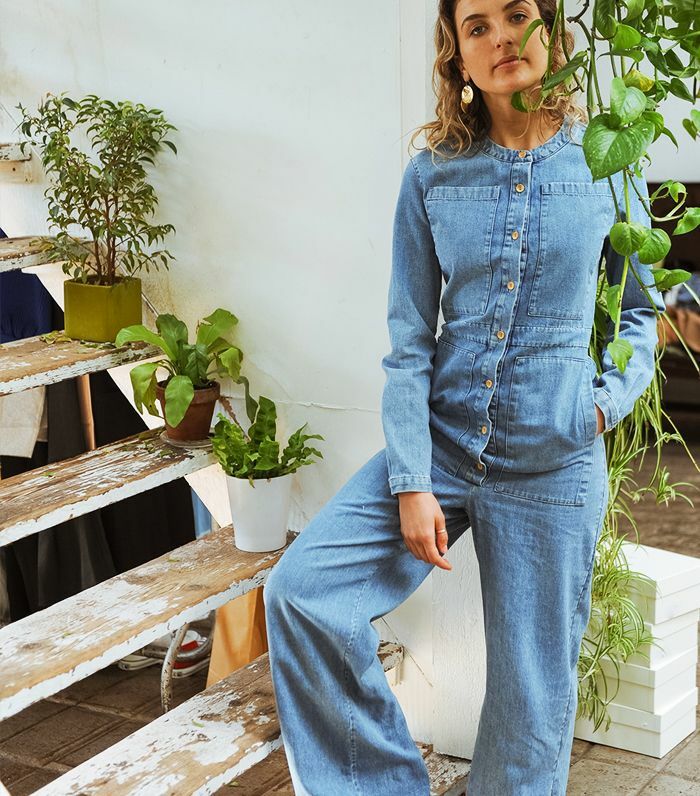 However, the denim industry is also one that hosts changemakers; forward-thinking brands and people have been using it as a springboard for launching more sustainable practices. With denim as the very backbone of the Western world’s wardrobe, it’s a very worthwhile place to begin. 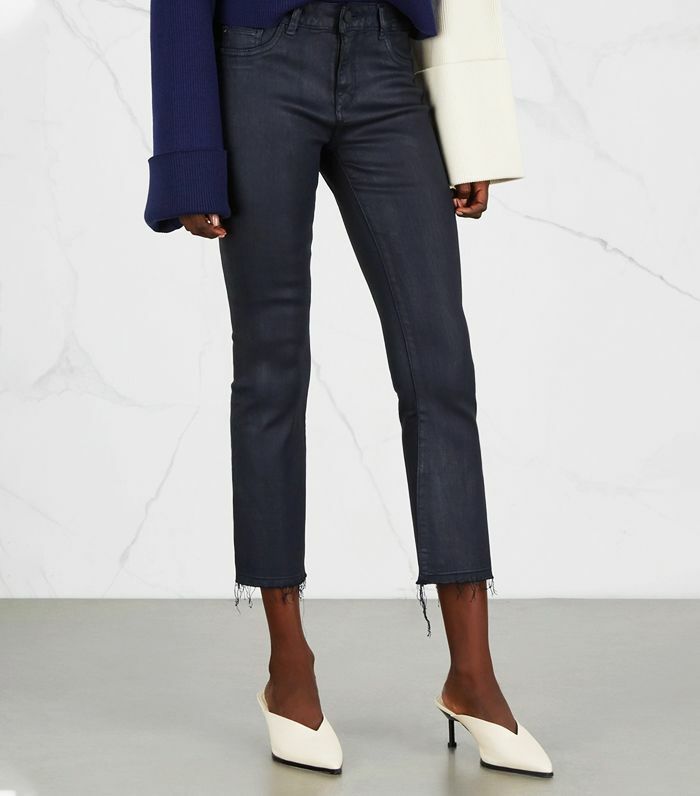 I have conversations every week with people who are either in the midst of finding sustainable denim or still feel completely paralysed by what shifting gears might mean (especially if they’re tied to a brand). And the truth is it is incredibly hard to be fully sustainable in every possible way. However, that shouldn’t be a reason to not start trying. One more sustainable practice is better than none, but you can start with three very easily. 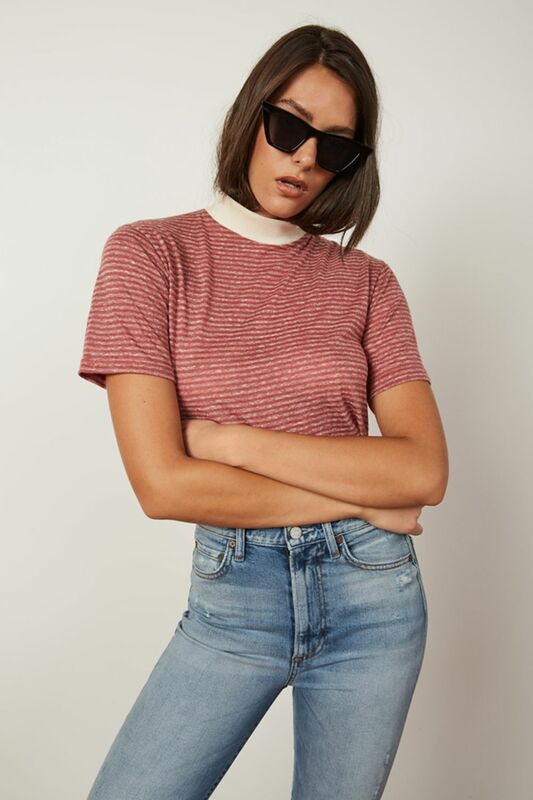 Firstly, shop from the brands below, or vintage and secondhand, and you’ll already be making a smarter, more informed decision. Secondly, learn how to wash your jeans in the least wasteful way. “Use cold water, as heating the water is what uses up 80% of a washing machines energy. Also, recommend to wash the least amount of times,” says Nordarse. Lastly, donate your jeans once you’re done with them, and before that point, see if you can get them repaired (a service some brands below offer). Don’t throw them in the bin—look to charity stores and resale sites, or simply pass them along in your circle of friends and family. I’ve done a lot of the research and hard work for you so that you can shop for denim from any of the below brands, knowing full well that you’re making a more considered and sensible choice. 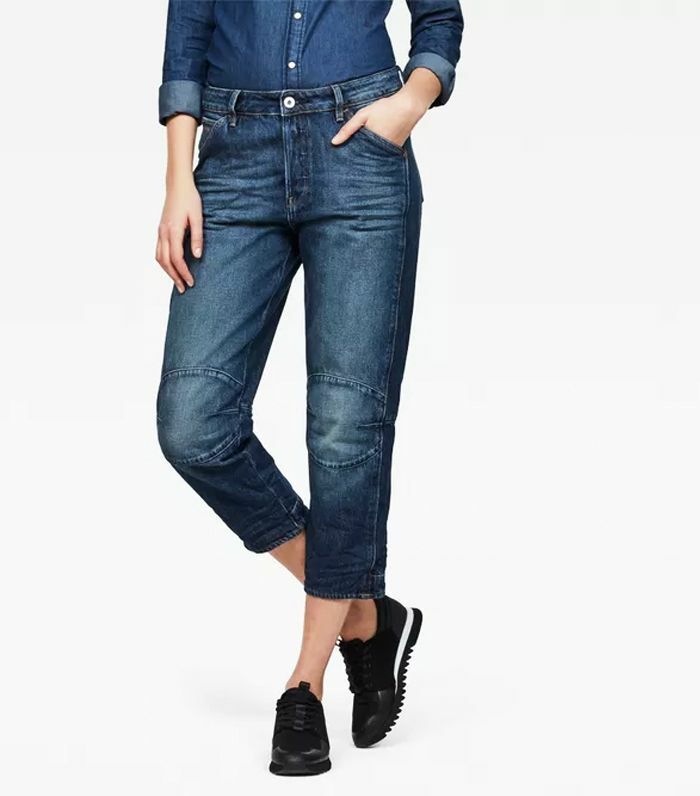 Boyish jeans use 1/3 the amount of water of regular denim. The brand also recycles all of the water it uses, so none of it is polluted in the process. 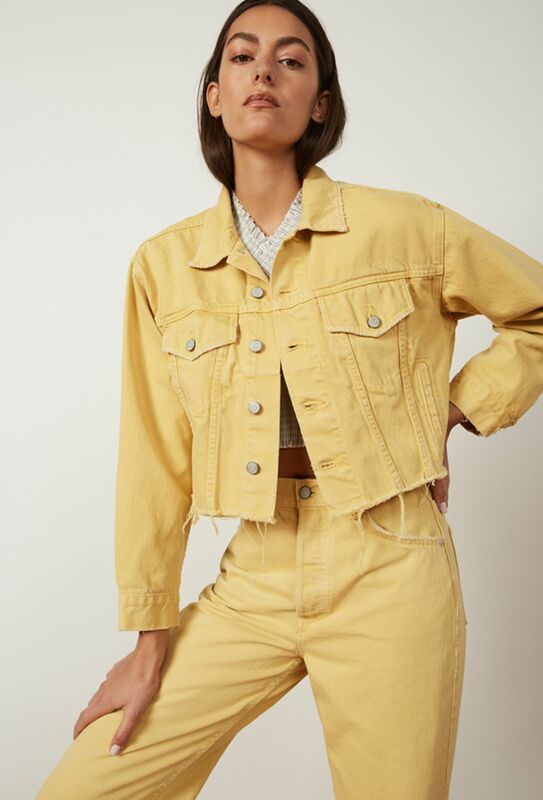 What Nodarse is most proud of with his brand is the fabric recycling involved, which contributes to its aim to have zero-waste in the production process. “It saves water and waste from entering landfills, which, over time, turn into methane gas that is more harmful to the environment than carbon emissions. We are known for having some of the higher content of recycled cotton, and we separate our waste yarn from indigo and natural. We only blend indigo recycled cotton into our warp yarns and then natural recycled cotton into our weft yarns. This way, the fabric doesn’t look or feel any different than a traditional 100% virgin cotton fabric,” he says. Boyish works with factories that have fair, safe and healthy working conditions and partner with suppliers who share a common vision of sustainability, accountability and transparency. The brand ensures that suppliers meet its standards for social responsibility as well as safe, non-toxic and better materials by auditing factories with third-party auditing companies. The brand uses Intertek (a leading quality assurance company) for all factory audits. There is a great deal more to read up on, and you can do so via Boyish’s sustainability section on its website. Bear in mind that these will be shipped in from the U.S. and are therefore subject to import taxes. London-based denim label Saltspin has always integrated eco decisions into its business model. The brand also invests in superior finishes to make its premium denim worth the price tag, because it’s all about the detail. In terms of sustainable practices to know about, Saltspin uses BCI cotton (a global non-profit initiative that standardises cotton farming and production) factories that are REACH certified (accredited by Intertek) and OEKO-TEX certified (a worldwide independent testing and certification system) to ensure that both people and the environment are considered in the manufacturing of its jeans. As well as using natural indigo dyes, Saltspin has recently introduced a laser-washing technique which uses 60% fewer chemicals, less energy and zero water but still provides a superior finish. You can read more about Saltspin’s sustainability commitment here. These flattering skinnies are made from rigid denim, so the brand advises to size up. London-based stylist Anna Foster established E.L.V. 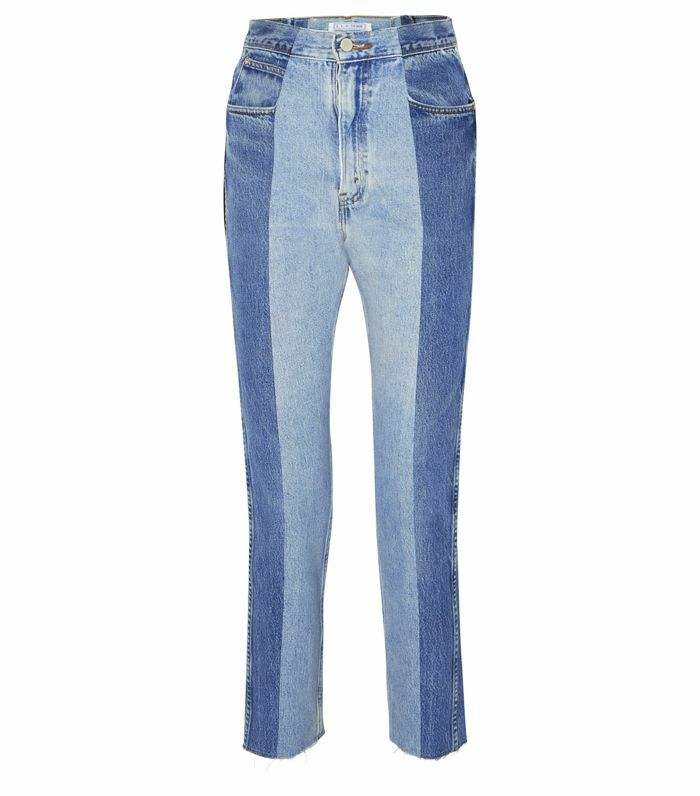 Denim only a few seasons ago, and it’s already stocked on Net-a-Porter and in many editors’ wardrobes. 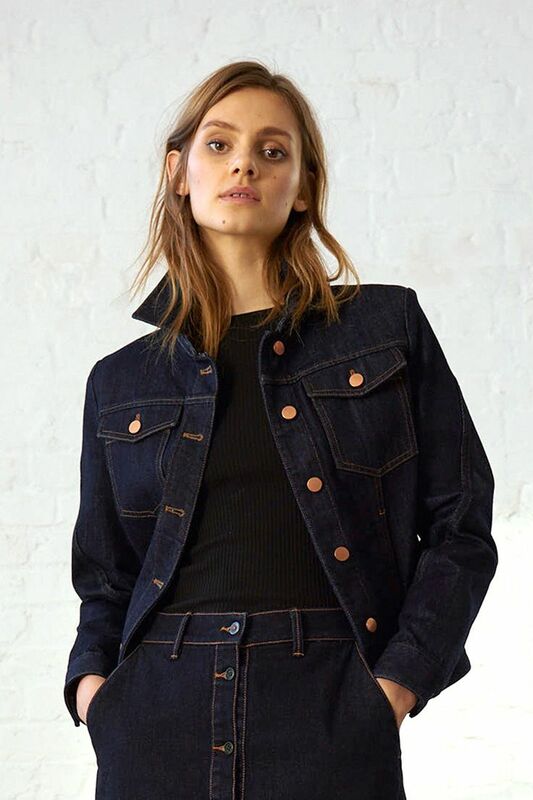 The zero-waste denim brand takes old, discarded denim and jeans and transforms them into new, perfectly tailored styles that are both ready to wear and can be made to measure. Many pairs are crafted out of two different vintage pairs, which means there are tonal differences and a super-unique finish. If you want these to sit on your waist, make sure you get the size that matches your waist measurement in inches. Last summer, everyone’s favourite London denim brand, M.i.h Jeans, introduced a Sustainability Manifesto. It was tied initially to the launch of a particular capsule collection called Paradise that featured certified organic cotton, environmentally low-impact treatments and water-reducing washes as well as great details like recycled swing tags. 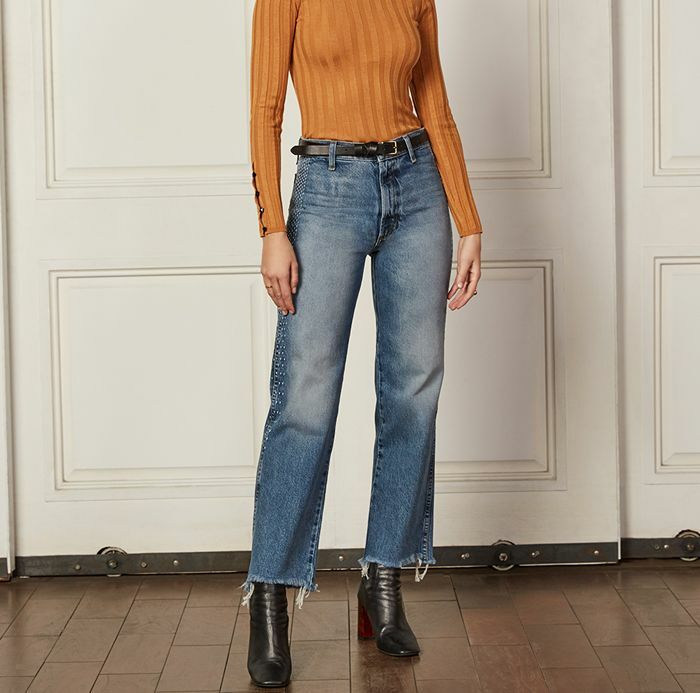 It is M.i.h Jeans’ goal is to reach a high level of sustainability in its collections by 2020, with a huge majority of the line’s cotton already reaching BCI standards. Also, the brand has become increasingly transparent about sourcing fibres, materials and how one can rewear and repair M.i.h. products. That latter point will hopefully encourage people to upcycle and repair their denim as opposed to throwing it out. All very exciting when you consider just how influential these guys are in setting the denim agenda in terms of trends and silhouettes. There’s a matching shirt and trench coat for double-denim lovers out there. MUD started out as a radically new concept where you could essential “lease” a pair of jeans. 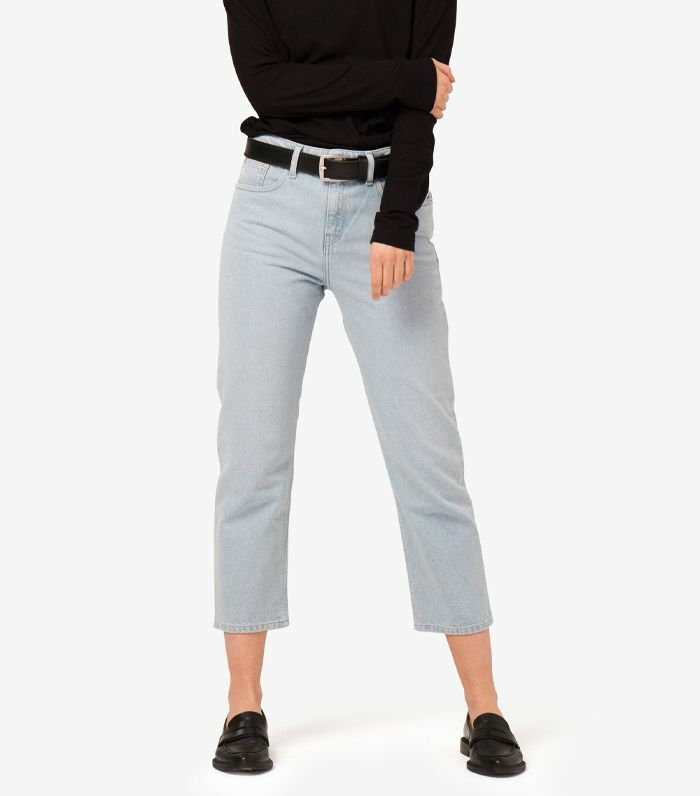 “After leasing your jeans for 12 months, you can decide to switch to a new pair, or better keep them until they are worn out,” explains the brand’s website. “The old ones will be recycled to make new wonderful items. Recycling saves water, resources and waste.” When you lease a pair of jeans for the year, you pay in monthly instalments of €7.50 plus a one-off subscription fee of €29. Being a MUD community member means you can lease three pairs of jeans at a time. The payments stop after a year and you can keep the jeans, but if you’re done with them and feel like switching them for something else, then that’s cool too. There’s also a repair service and an option to lease alternatives. As well as this clever purchasing concept, MUD also takes a great deal of care in using recycled fabrics. All of the styles include a percentage of post-consumer denim and organic cotton. You can read much more about the brand’s sustainability efforts and leasing process here. Trust the Danes to push forward in such an innovative and different way. 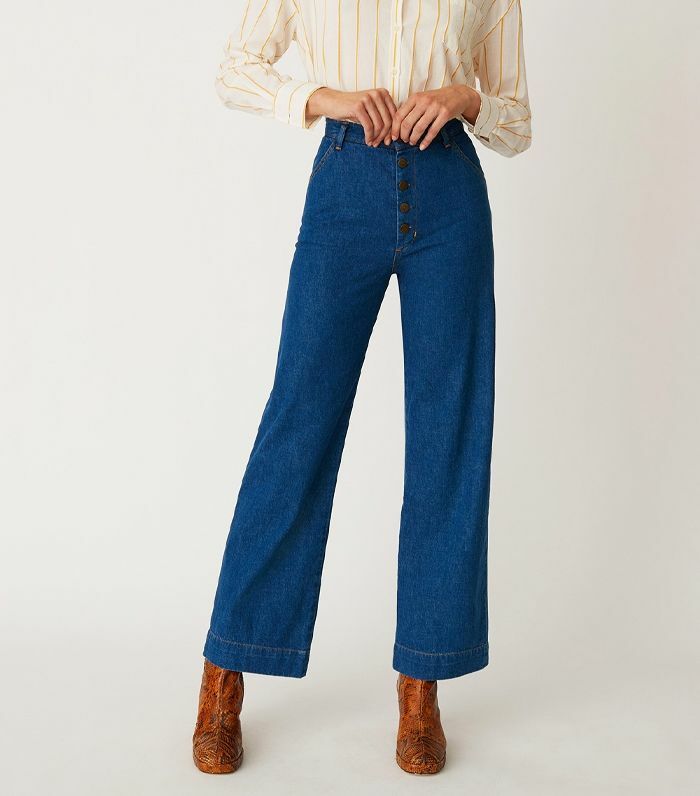 Next, see the trending jeans of 2019.